In the space of a few months we’ve gone from hailing blogs as the biggest and most important thing to happen to the media landscape in a generation, to discussing whether the end is nigh and if they’re really the future of content consumption at all. So where is this chatter coming from? Over the last decade blogs, vlogs and social media stars have changed the way we communicate, source information, get our kicks and find inspiration. They provided the ultimate escape from over-airbrushed, over-edited, over-marketed magazines and advertising, instead showing ‘real people’ and bringing their ‘real opinions’ to the forefront; we swapped ultimate glossiness for a sprinkle of reality, but over the last few years the lines have undoubtedly been blurring. Although it started from a place of realism and provided an antidote to the images that left us collectively feeling less than confident about our appearance, many of these social media darlings are now showcasing the very things that we were challenging: hugely aspirational lifestyles, incredibly over-edited and over-stylised imagery, endorsements and collaborations that are less than authentic and a focus on consumerism over self-care. 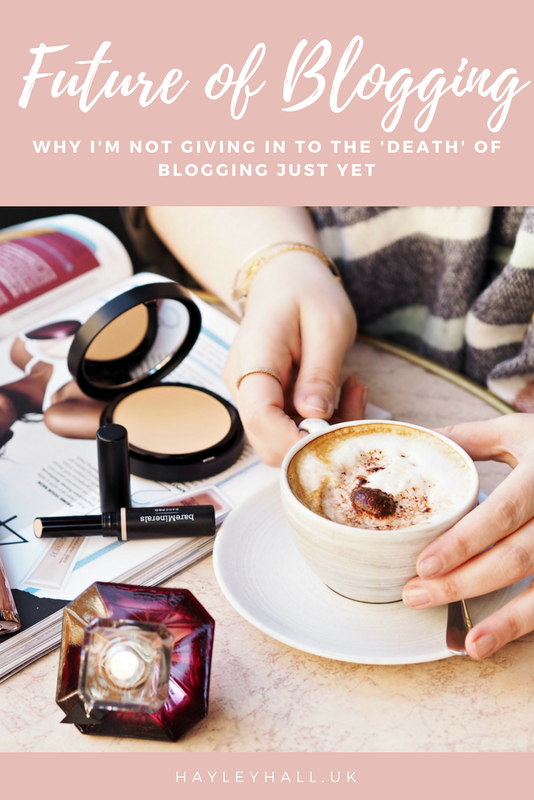 There may be a resurgence of #relatable and raw content, but fundamentally our industry is at a crossroads; is this an opportunity for us to flourish, or is the death of blogging really upon us? There’s no doubt that we’re all struggling right now, seeing the negative impact of everything from an Instagram algorithm that prioritises big name content to the fact that comments are at an all time low. With the hundreds of thousands of new pieces of content being published every single day, it’s harder than ever to gain and retain the attention of a core audience; it’s almost impossible to grow without a big break or the endorsement of a super YouTuber, and with thousands of sites offering the same thing we’re all competing for the same campaigns and brand relationships. I’m not gonna lie – it’s bloody hard. I’ve definitely noticed a drop in my following, general stats and engagement across all platforms over the last twelve months, and after eight years of building a brand it’s painful to witness. Admittedly I have reduced my content production by about a third overall (and completely re-branded,) but I definitely lose more than I gain – and I’m not alone. I hear more and more than bloggers are hemorrhaging followers, losing a big percentage of their monthly hits and falling from the attention of readers they’ve had supporting them for years. But you know what? It’s no reason to panic. The growth of platforms including Snapchat, Insta Stories and Facebook Live have enabled us to deliver and consume content in the moment with a sense of immediacy about it; often we don’t have the patience to devour a full magazine, in the same way we don’t always want to read a 1000 word article on how to style up a trench coat, but we will take a quick look at the pictures. Instagram has become such a huge focus for so many (because of our desire for photographs that tell a story,) that they’re practically ditching their home-grown sites altogether – but in my opinion that’s not a long-term way to future-proof your brand, or your income. Although the grid is hot right now, we know there are more problems with Instagram than there are with the Brexit strategy; Snapchat lost millions of dollars off its value and lost users quicker than the Titanic sank after Kylie Jenner and Rihanna expressed their lack of support for the platform; YouTubers have been vocal about the restrictions placed upon them to monetise their sites (or even get their content seen,) while Facebook is being pulled apart for effectively letting their users data be sold to the highest bidder. These sites have a purpose and value yes, but we don’t own them and we don’t have control about what happens next – all it takes is for a new algorithm or media storm to render our content practically invisible, but with your own blog you will *always* retain authority. My site has provided me with a place to express my opinions, be creative and build a community of like-minded people; it allows me to tell stories without limit or restriction, and it permits that content to be discoverable indefinitely. Unlike Instagram, where my image is lucky to have a lifespan of 24 hours, some of my most popular blog posts continue to be those that were written five years ago – and I know where I’d rather put the majority of my effort. That’s not to say I don’t love a bit of Insta, that you won’t find me nattering over on Twitter or pinning my latest pics to Pinterest, but my blog will always be the amalgamation of all those ideas and conversations in one place. I’m thankful to have developed an incredible core audience that support everything I do and continue to read pretty much everything I write; I’m so grateful for the comments and lovely words they read and the fact they go out of their way to see what my opinion is on a hot topic or new launch. The value I have isn’t in my staggering numbers or ability to say I’m the biggest or the best, but in the fact that I have a readership I’m proud of and a long-standing relationship with many of them who’ve been there with me from the very start. New readers discover me every day, but instead of chasing growth or worrying about where I’m heading, I take comfort in the fact my point of difference is so much more than my stats. From my point of view, my blog is where it’s at – and as long as you keep on reading, I’ll be here keeping on writing. What are your thoughts on the future of blogs, both as a reader or content creator yourself? Thanks so much! My concern is with every algorithm change people can just lose a following or income, and we have no control over it – my blog will always give me the control in the long term, and that's something I won't give up. Very well put! I only watch YouTube and read blogs myself – so no Instagram, Facebook etc.- but I must say I value both sources of information. For 'how-to's' I turn to YouTube, while for well researched information and lists I prefer blogs. Also, I really do enjoy how well you write – writing blog posts takes longer than communicating via other platforms, which pays off regarding style and structure. Yes, please keep writing; I will keep reading! Thanks so much Katharina! And yes, different channels have different purposes and we also have different skillsets; I'm rubbish at video editing, but I love sitting down to write something. I'm glad it's received so well! There's such an assumption that everyone is on Insta, and it's not true – it's a very specific audience, but not all incompasing. And thank you for your support! Glad to hear it Mae! I love this! Thanks. I just found your blog and love that you're not giving up. I actually have a post coming up on Instagram on my own blog. It is relevant to what you're saying. I like how real you get about how un-real things are getting. Welcome! And do let me know when you write it – would love to read. I agree with you. I think that even though generally people would rather quickly skim through Instagram in a quick 10 minutes, but I know when I actually want to do something, or find out information I'm much more likely to head to a blog and read about it. Social media isn't going to disappear, but it is forever changing and what I love about blogging is that it can change just as easily, sometimes more so as we are in control of our own sites. For the people I follow, I want to read their blogs! I do follow on Instagram, but that's like cheeseburger while the blog post is the sit down a la carte main course, Instagram isn't going to satisfy me on its own (I'm not on Facebook or Twitter, but I do see the occaision video on you tube). There just isn't the possibility of in depth content on Instagram, and it tend to show just the good and ignores the bad and the ugly which blog content tends to do very well.There is of course the fact that bloggers own their own blogs, they don't own Instagram, Facebook etc, and they can't always control who sees their content or when they see it. If you are only on one platform and that goes belly up, it would be catastrophic. So keep on doing what you are doing Hayley, because, I for one will be back! Great post! Some astute insights there, all of which I agree with! You're right that whilst blogging is getting harder in terms of maintaining people's attention or acquiring new followers, it will likely always be around due to its timeless format and reliability.There's a reason that email has always been one of the most powerful marketing strategies – back in the 90s it was, and it still is now. A social media platform can disappear or lose favour at any moment – which means all of those hard-earned followers won't mean anything anyway. That's why I believe strongly in bloggers building their email lists – and why I just subscribed to yours ;)Keep up the amazing work! Hasn't the "death of the blog" been predicted for at least a couple of years now? I I follow a handful of bloggers who have stayed the course through all the social media ups and downs over the last decade and I'd miss them if they disappeared. Yes, blogging has changed, especially if you want to make a career of it, but as a trust worthy medium for every topic under the sun, I can't see it being replaced. I love Instagram for micro blogging, but wouldn't want to give up my blog. I'm far from any kind of big blogger (right now, after a rocky path I have like 10 regular followers) but I have had a blog since 2005 and it's still my favourite forum on the internet. Even though pretty much all my good reads have died out and transported themselves into the easier format of mobile apps, I still remain with my blog and I'm sure I will keep on doing it. The fast, instant clicks, likes, scrolls, it just isn't my thing. I still use them but I prefer the slower format, where you get to take part of the blog writer's perspective in larger pieces of text and thoughts than is really manageable on the apps. And I get to decide what I'll see for myself, no algorithms or some machine sorting things out "for me". Blogs it is!